Male Northern Flicker, photographed along Sycamore Creek, Mazatzal Mts., Maricopa Co, Arizona, USA. Dec 2009. 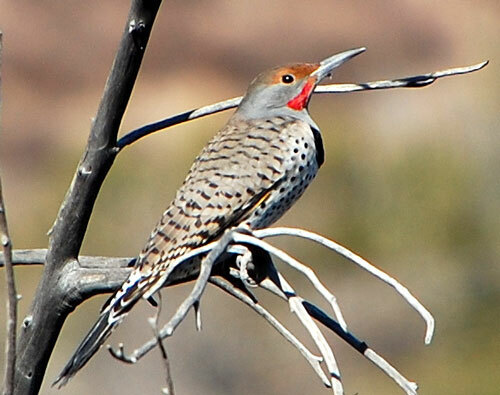 Northern Flicker is a common and conspicuous inhabitant of Arizona's sycamore woodland galleries, especially at the higher elevations. Flickers are substantial woodpeckers with strong chisel-beaks which they use to excavate nest cavaties and to extract insect prey. Among their most important prey are ants, especially carpenter ants. Carpenter Ants (Camponotas sp.) are large and frequently form large colonies in rotting tree trunks/logs. Carpenter ants are not defenseless, however: In addition to a powerfull set of mandibles they can spray a mist of formic acid to repell attackers. Flickers are able to tolerate a lot of acid before they break off a feeding session. Flickers will eat berries and nuts when available. In winter they come to suet and seed feeders. The jet-black bib and with conspicuous spots on a whitish background below easily distinguish the flickers. In flight, flickers have a conspicuous white rump. The back is gray-brown with black barring. Western Northern Flicker is also referred to as the Red-shafted Flicker because the shafts and bases of the primary flight and tail feathers are salmon-red - these feathers become visible when the bird is in flight, revealing the underside of the wing feathers. The red slash on side of the head and neck of the bird at left indicates a male. Females usually lack this mark but have a small patch of red at the base of neck.